WHAT will put you to sleep, wake you up, improve your hearing, and teach you card tricks, foreign languages, or duck calls? Simple enoughâ€”your phonograph. New disks make it a jack-of-all-trades to serve your need or fancy. 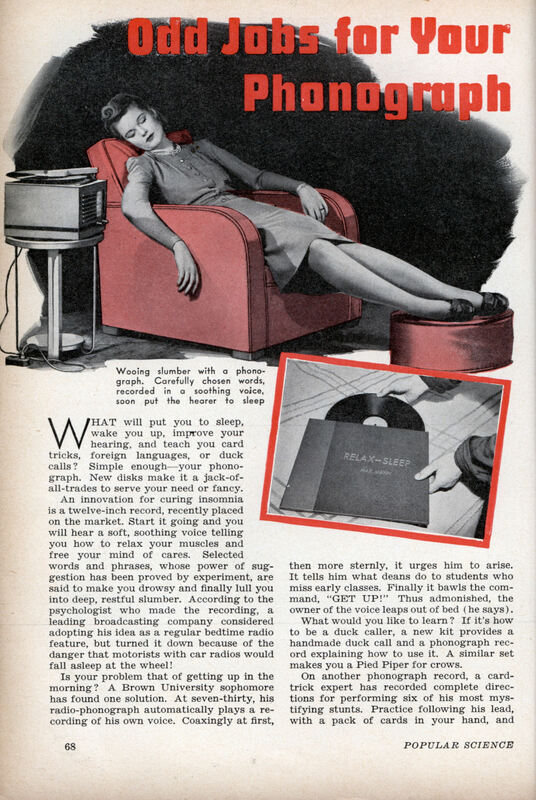 An innovation for curing insomnia is a twelve-inch record, recently placed on the market. Start it going and you will hear a soft, soothing voice telling you how to relax your muscles and free your mind of cares. Selected words and phrases, whose power of suggestion has been proved by experiment, are said to make you drowsy and finally lull you into deep, restful slumber. According to the psychologist who made the recording, a leading broadcasting company considered adopting his idea as a regular bedtime radio feature, but turned it down because of the danger that motorists with car radios would fall asleep at the wheel! Is your problem that of getting up in the morning? A Brown University sophomore has found one solution. At seven-thirty, his radio-phonograph automatically plays a recording of his own voice. Coaxingly at first, then more sternly, it urges him to arise. It tells him what deans do to students who miss early classes. Finally it bawls the command, “GET UP!” Thus admonished, the owner of the voice leaps out of bed (he says). What would you like to learn? If it’s how to be a duck caller, a new kit provides a handmade duck call and a phonograph record explaining how to use it. A similar set makes you a Pied Piper for crows. On another phonograph record, a card-trick expert has recorded complete directions for performing six of his most mystifying stunts. Practice following his lead, with a pack of cards in your hand, and you’ll soon be the life of almost any party. In case your ambition is to parlay-voo in some foreign language, you will have no trouble getting recorded lessons in almost any tongue you choose. And a boon for people inclined toward deafness, just announced, is a special record giving successive tones of different pitch for exercises in hearing. Looks like the lady in the easy chair could use some. 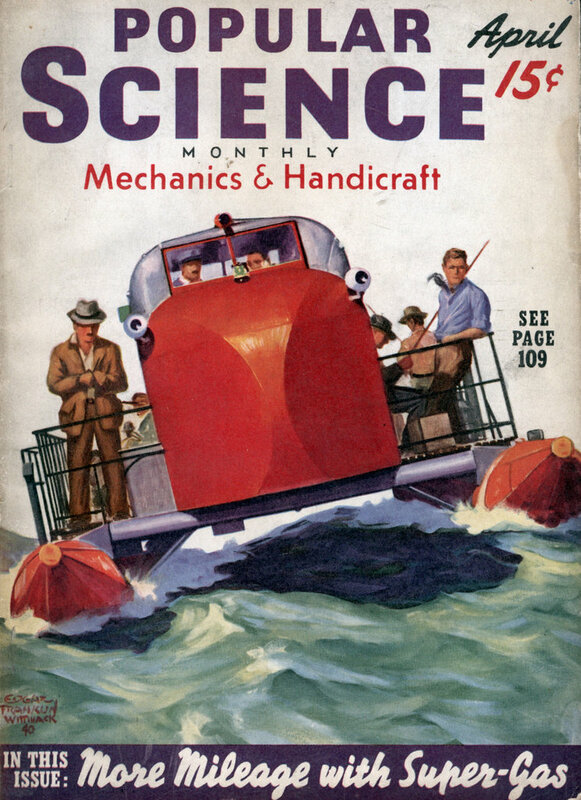 So if you’re a 45-year-old college student or if you’re George Burns and want to learn how to use a duck call, just get yourself a phonograph! I wonder if a ‘stern lecture’ in one’s own voice (which would sound very different) would be of much use after the second or third time. One of the old Macintosh ads had sleepy college students using the $2000 computer as an alarm clock. I think there’s an application that plays an MP3 at a predetermined time available for Windows.